Director Chad Stahelski does a terrific job balancing plot with action and the stunt coordinators should be commended for some really great sequences. "John Wick is the guy you send to kill the boogeyman". Make no mistake about it, John Wick (Keanu Reeves; The Matrix) is a badass. He is not the guy you want to make angry, nor do you want to double cross him. He has skills in hand to hand combat and is an expert marksman. He will find you and make you pay before you know what hit you. If you are an action movie fan, you hopefully have already seen John Wick and are anxiously awaiting the sequel to hit theaters later this month. However, before you shell out $10 for that movie ticket you are going to want to brush up on the original, out in stores on Blu-ray 4k Ultra HD, Blu-ray and Digital download. At an hour and 40 minutes in length, it is well worth your time, especially if you are an action movie aficionado. John Wick was the badest of the bad in the hitman world. He had a reputation for getting the job done. However, after meeting his wife, John wanted out of that world and eventually managed to obtain his freedom. Leaving it all behind, he lived a wonderful life until his wife suddenly passed away. The week of her funeral she sent John a puppy so he would have something to love. That same week, John and his car caught the attention of the son of Russian mob leader, Viggo Tarasov (Michael Nyqvist; Mission: Impossible -Ghost Protocol). Being the spoiled brat he is, the son, Iosef (Alfie Allen; Game of Thrones) decides to break into John's house, beat him up, kill his dog and steal the car. As Vivian from Pretty Woman would say..." Big mistake, big, huge…". John decides to go after Iosef, kill him and hits a few other bad guys along the way. Reeves is a great choice to play John Wick. He is calculating and introspective and Reeves manages to pull it off well. However, because of his innate "laid back" nature, it was a little difficult to find him convincing when he gets really angry and one scene when he is almost yelling was actually kind of funny to me. The supporting cast, including Willem Dafoe (Spider-Man) and Ian McShane (Ray Donovan), tend to be bit players in this film but have strong performances none the less. Director Chad Stahelski does a terrific job balancing plot with action and the stunt coordinators should be commended for some really great sequences. This is Stahelski's directorial debut and this movie is the perfect vehicle for him to show his talents. Coming from a stunt coordinator's background, he showcases the scenes beautifully without going overboard. The 4K Blu-ray is presented in 2160 high definition video, which is an incredible viewing experience. Even a simple carrot looks amazing with the clarity this technology offers. If you long for exceptional picture quality, you really need to invest in a 4k television and Blu-ray player because it changes the overall look and feel of a film and is really spectacular. John Wick is just one example of this superior quality. The Dolby TrueHD 7.1 audio is outstanding and the surround sound is an immersive experience. Every bullet flying and every explosion is a masterpiece, and the dialogue and sound effects mix is well done. The soundtrack has a hard edge to it which fits the film nicely and will surely please anyone who prefers a hard sound in their musical selections. The 4K Blu-ray offers the same selection of extras as the traditional Blu-ray release. 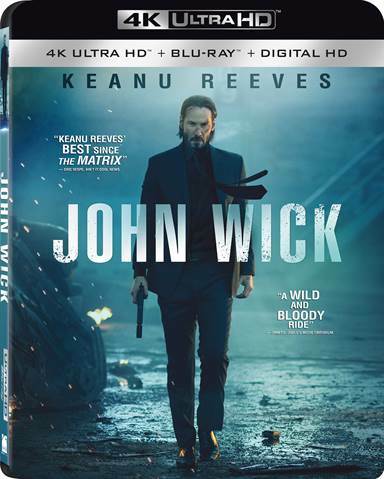 These include: Audio Commentary with the filmmakers, Don't F*#% With John Wick – a 15 minute look at how Reeves trained for the combat scenes and how they were choreographed, Calling in the Cavalry – 12 minutes of several aspects of the film including how they initially pitched the movie, Destiny of a Collective -6 minutes of the Chad and David "Bromance", The Assassin's Code –an interesting 5 minute look at the world of the hitman, The Red Circle – 6 minutes about the infamous nightclub scene in the film, Theatrical Trailer – 2 and half minutes long and N.Y.C. Noir – a 6-minute look at NYC and how it shaped the look and feel of the movie. Most of the extras are fairly interesting but the combat scenes and training feature was probably the most enjoyable for me. For those who love well-done action sequences, this movie does a great job and is one that should be definitely owned and watched more than once. Here's to hoping this month's sequel can live up to the original. Download John Wick from the iTunes Store in Digial HD. For more information about John Wick visit the FlickDirect Movie Database.